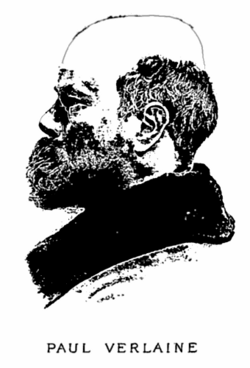 Paul Verlaine illustrated in the frontispiece of Oeuvres complètes de Paul Verlaine, Vol. 1, 1902. Paul Marie Verlaine (March 30, 1844 – January 8, 1896) is considered one of the greatest French poets of the late nineteenth century associated with virtually every major literary movement of his era. Originally associated with the poetic movement known as the "Parnassians" that was closely associated with the Romantic poetry of earlier decades, Verlaine went on, as he matured, to befriend Charles Baudelaire, Stephane Mallarme, and other leading poets of the Symbolist school. Verlaine's poetry, with its visionary images and dense metaphorical complexity, represents the apotheosis of the Symbolist aesthetic. Verlaine took it upon himself to "reform" French poetry by writing sonorous, almost musical poetry where the sounds of the words were as important (or even more important) than their actual meaning. Much like Mallarme, Verlaine believed that poetry should subvert the conventions of everyday language, vexing the reader into a new state of mind by its very strangeness. In symbolism, the poet becomes a kind of secular priest charged with revealing a higher truth. Verlaine's greatest poems read almost like magical incantations, full of exuberance and astounding passages of verse that seem to shimmer on the borderline between meaningful language and incomprehensible visions. He is considered, along with Mallarme and Rimbaud, to have revolutionized the way French poetry was written. In the wake of Verlaine, French poetry would explode into the frenzy of innovation that would dominate the decades of twentieth century Modernism. Verlaine, however, was not a Modernist, rather, he is perhaps the most crucial link between nineteenth-century Romanticism and the Symbolists, as his poetry synthesized and transcended the best qualities of both schools. Verlaine's work informed the next generation of Symbolists, including Rimbaud and Valery, and it continues to awe and inspire students of French poetry to this day. Verlaine was born in Metz. The only child of a moderately well-to-do family, Verlaine was educated at the Lycée Bonaparte in Paris. He began writing poetry at an early age, and was initially influenced by the Parnassien movement and its leader, Charles Leconte de Lisle. At the age of 14 he sent a copy of his poem Le Mort to his hero, the Romantic poet and novelist, Victor Hugo. In 1862 Verlaine obtained his baccalauréat, graduating with distinction in Latin, and he found employment first as an insurance clerk, then later as a low-level civil servant in Paris' municipal government. During this time Verlaine continued to write poetry and frequent literary cafes, where he met the principal members of the Parnassian school and other talented contemporaries, including Mallarme and Anatole France. Was a delicate feast for a young fool's heart. Interceptés—et nous aimions ce jeu de dupes. At the proclamation of the French Third Republic in 1870, Verlaine joined the one hundred and sixtieth battalion of the National Guard, turning Communard on March 18, 1871. He became head of the press bureau of the Central Committee of the Paris Commune. When the Commune collapsed, Verlaine escaped the deadly street-fighting known as "The Bloody Week" and went into hiding in Pas-de Calais. He returned to Paris in August 1871. In September 1871 he received a letter from a young poet, Arthur Rimbaud, imploring the older poet for advice. Verlaine was struck by the quality of the poems Rimbaud sent him, and soon the young poet had come to stay with the Verlaines in Paris. By 1872, Verlaine, ever emotionally fickle, had lost interest in Mathilde, and effectively abandoned her and their son, preferring the company of Rimbaud. The two set off on a notorious tour of Paris and Northern Europe, indulging in drugs and debauchery and causing a scandal wherever they went. Influenced by Rimbaud, Verlaine during this time began to write "impressionistic" poetry in a style that would later be called Symbolist, and which he would collect and publish in the volume Romances sans paroles (Songs Without Words). Romances is a particularly important touchstone in the evolution of French poetry because it contains some of the earliest prose poems written in the language. Verlaine's poems of this time are among the most experimental and poetically innovative of the nineteenth century. Meanwhile, Verlaine's life was continuing its descent into shambles. By the end of 1872 he had arrived with Rimbaud in London, where they met a number of other exiles from the Paris Commune. Soon after their arrival, however, Verlaine and Rimbaud had a violent falling-out. Verlaine was a heavy drinker, and he shot Rimbaud in a jealous rage, wounding but fortunately not killing him. Rimbaud fled London in terror, and when the two met again in France Verlaine was arrested and imprisoned at Mons, where he underwent a conversion to Catholicism, which again influenced his work. Following his release, Verlaine traveled to England, where he worked for some years as a teacher, producing another successful collection, Sagesse (Wisdom). His conversion to Catholicism seems to have been sincere, and, in a mood of severe penitence, Verlaine began an exhaustive study of English literature. He became an ardent admirer of the works of Shakespeare, Tennyson and Dickens in particular, and the influences of these English authors would all go into his volume Sagesse. During this time Verlaine began to receive the critical praise that had eluded him all his life—the younger poets of the Symbolist school, including Mallarme, began to view Verlaine as a role-model. Although Verlaine was flattered by his newfound fame, he would distance himself from some of the more radical poetic experiments undertaken by the Symbolists; most notably, he would lament the Symbolist preference for free verse, believing that French poetry fundamentally required meter and rhyme in order to function. Verlaine's last years witnessed a descent into alcoholism and poverty. He continued to write, but his genius was waning. He published a handful of well-received volumes, including Les Poètes maudits and Jadis et naguère but these mostly contained poems he had written years earlier, in prison. He wrote prose to pay the bills, publishing a biographical series on contemporary poets and several books of memoir and travel writing. Verlaine's criticism in particular is considered influential, because it brought attention to a number of other major poets of Verlaine's time who had failed to receive public recognition, including Mallarme and Rimbaud. Unfortunately, almost all of Verlaine's poetry from this later period is lacking in the insightful power of his earlier verse. He died, literally penniless, in January 1896, and was interred in the Cimetière des Batignolles in Paris. Verlaine, Paul. Correspondance générale: [Vol.] I, 1857-1885 Edited and annotated by Michael Packenham. Paris: Fayard, 2005. This page was last modified on 4 April 2008, at 02:14.